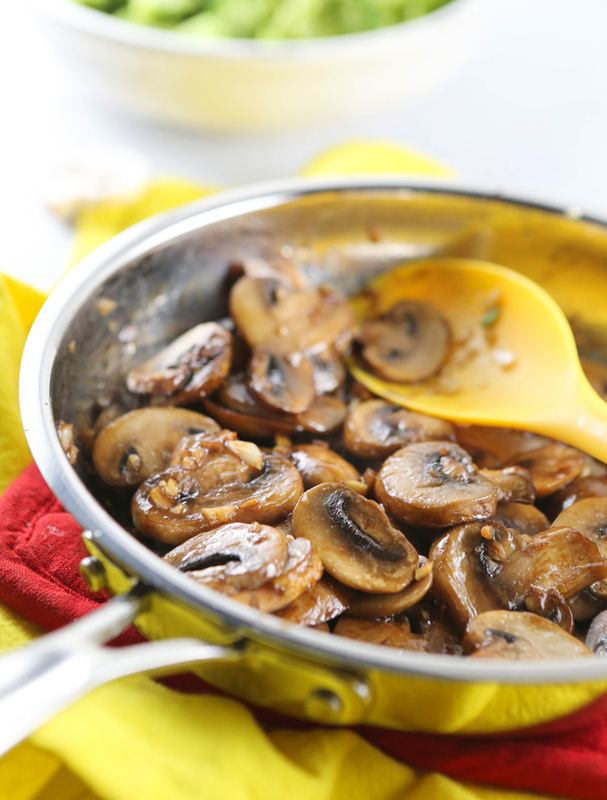 Soy Sauce Glazed Mushrooms Recipe — Pip and Ebby - easy, delicious recipes! This is such an easy, savory side dish and it is packed with flavor. Soy sauce and mushrooms are a great combo! I have been home for two days, but I still have my recent vacation on the brain. I hate the reason the vacation happened, but I LOVE that it happened. I spent time with old friends, met some new ones, and we had a TON of fun. There were tears, but way more laughter. I will cherish those memories forever! One of the most memorable parts of the trip involved jumping off of an 855-foot tall building with a fellow heart mama friend. Let me tell you.. I have jumped out of an airplane over 300 times and I have NEVER been as scared as I was standing on that ledge overlooking the Las Vegas strip. I was shaking, terrified and feeling like I could pass out. Then...I jumped. And I was filled with the same peace I feel when I exit an airplane. Falling from the sky makes me happy. Not at all on equal ground.. Mushrooms make me happy, too. Seriously, I love them. Dan thinks I'm nuts. I think he's nuts. This recipe is SUPER simple and SUPER delicious. Melt 2 tablespoons of butter in a skillet over medium heat. Add an 8-oz. package of sliced mushrooms and cook, stirring, for 5 minutes. Add soy sauce and cook until the liquid has evaporated, 4-5 additional minutes. You will eat them straight from the pan, I promise. If you are a mushroom person, that is. If you're not, this Chicken Veggie Ramen Bowl or these Havarti and Crab Stuffed Mushrooms might change your mind! Easy, savory side dish that is PACKED with flavor! Melt butter in skillet over medium heat. Add mushrooms. Cook and stir until the mushrooms have softened, about 5 minutes. Stir in the garlic and continue to stir for 1 minute. Add soy sauce, stirring until liquid has evaporated, about 4 minutes.